Adults are always looking for that perfect cozy spot in the house to relax in, whether it be a great sectional, the heirloom Lazy-boy or the plush new chair from the furniture boutique around the corner. So why wouldn’t we want the same for our babies? They spend so much time lying on their backs in cribs or on their tummies on the floor in their first few months that it’s nice to give them a chair of their own to sit in and catch a view of what the rest of the family is doing. Enter the baby bouncer. 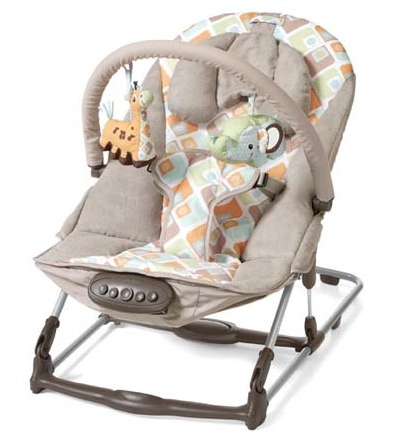 More specifically Infantino’s – Fold & Go Bouncer. This bouncer’s sleek design and fresh pattern fit into any decor and it’s unique fold-flat design make it easy to use anywhere. Infantino created the fuss-free assembly with moms in mind. Once out of the box I had it assembled and my baby in it in under three minutes – wow! The three-step fold is just as quick – taking only seconds to flatten for portability or storing. 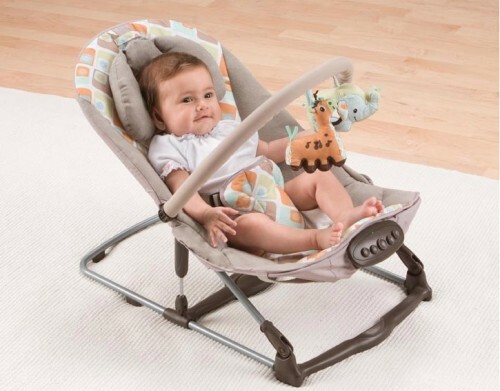 Anyone that has saved a bouncer chair for their next child or taken one on vacation knows how cumbersome many of them can be but the Fold & Go is completely flat and compact. We never hesitate to bring it along when out visiting. The chair is designed for use from birth (5 lbs) to 25 lbs and we have been testing it through the different stages. When my baby was smaller the padded headrest kept him from slumping to the side and he was easily soothed with the vibration and heartbeat settings. Now at almost five months old and 19 lbs he enjoys kicking his feet to the upbeat songs while seeing what is going on around him. 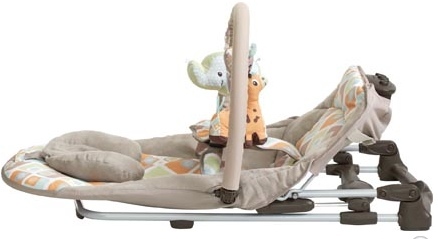 The adjustable toy bar with a friendly giraffe and lion have been a favourite feature throughout the use of the chair. This toy bar is extremely customizable because it not only moves forward and backwards but is fully pliable (much like those bendable hair curlers made of wire covered in foam) to place the toys in the best position for your baby. My boy is a big baby and can easily sink a typical bouncy chair so that he is almost lying flat. This chair is so sturdy that even as he gained weight he remains upright. As a newborn he startled easily in other bouncers as they would rock or bounce at the slightest movement but the Infantino Fold & Go’s bouncing action occurs with baby’s natural movements and is much more subtle. My favourite feature of the chair is the extremely wipeable fabric. For everyday spit ups, accidents or spills a damp cloth does the trick. 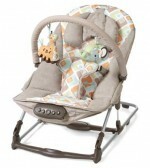 To use around the house or for vacations and visiting, the Infantino Fold & Go Bouncer is our chair of choice.